At the end of each year, we ask roasters for coffees they are offering consumers as special holiday selections, whether blends they have composed specifically to commemorate the holidays or single-origin coffees considered special in some way — perhaps because of limited availability, relative rarity or unusual quality. This year, we received 35 samples, ranging from small-production, quite expensive coffees from trees of the celebrated Gesha (also spelled Geisha) variety to affordable, widely available blends. And this year we identified what we took as a new category of holiday offerings. Call them emerging classics, coffees of styles and types that were, until recently, relatively experimental or rare, but are now becoming familiar: elegantly managed natural-processed Ethiopias, for example, or coffees from the big-beaned Pacamara variety. The scores for the 35 coffees we cupped for this report ranged from 85 to 96. Twenty-six rated 90 or above, suggesting very high quality across the wide-ranging styles of submissions. The average for all scores was a very impressive 92. We chose the top 12 coffees to review, all of which scored 93 or higher. Below is an overview of these coffees, as well as some musings about some trends in specialty coffee these high-rated coffees suggested. The El Burro is more nut- and spice- than floral-toned, and the Duncan Estate, bright, crisp and sweetly citrusy. These aroma and flavor distinctions may in part be accounted for by roast profile; the Geisha Coffee Roaster’s El Burro is roasted toward the dark end of medium, while the Noble Duncan Estate is definitively light-roasted. Though these three coffees are not inexpensive by any standards, they are a bit less pricey than other Geshas we’ve seen this year; all land in the $4-per-ounce to $6-per-ounce range. The Noble is certified organically grown, unusual for a Gesha. The top-scoring coffee of all, however, was not a Geisha, but a combination of wet-processed Typica and Red Caturra varieties roasted by Paradise Roasters: Hawaii Kilauea Volcano Nano-Lot (96). At $24 for four ounces, this is the most expensive coffee (and most limited in quantity) reviewed for this report. Lush and exotically sweet, it was grown on Jim Chestnut and Edna Arawaka’s three-acre farm of 335 trees in the Puna District of Hawaii, at an altitude of 3000 feet (900 meters), which is nearly double the altitude at which most coffee is grown in the better-known Kona and Ka’u districts across the island. With notes of plumeria, red currant, lime zest and frankincense, it is a beautiful coffee that will appeal to anyone who seeks the combined thrill of novelty and rarity. The roaster has only 30 pounds of this highly selected coffee to sell. While coffee blends are ubiquitous year-round, a great deal of particularly thoughtful curation seems to occur among specialty roasters when they approach their special holiday blends. Three holiday blends rose to the top of our list this year: Per’la Specialty Roasters’ Miami Winter Holiday Blend (94), Red Rooster Coffee Roaster’s Sweet Holiday Blend (93), and Magnolia Coffee’s Poinsettia Blend (93). In what seems to be an increasingly common (and heartening) practice among small coffee companies, all three roasters disclosed the basic components of their exceptional blends. The Per’la blend is comprised of coffees from Ethiopia and Kenya; the Red Rooster is a selection of washed Honduras and both a natural-processed and washed Ethiopia, all organic; and the Magnolia is a blend of coffees from Papua New Guinea and Costa Rica. This trend toward transparency speaks to consumers’ increasing demand for quality, as well as roasters’ desire to set themselves apart with creative and original coffee blends that make a statement about their brand. There are no generic “filler” coffees in these impressive blends. Perhaps the most interesting category we’ve identified this year in terms of trends is what we’re calling emerging classics: once unusual, innovative coffee types that have dramatically increased in popularity over the last five or so years, including coffees produced from distinctive tree varieties (like the Pacamara reviewed here) or unorthodox processing methods. 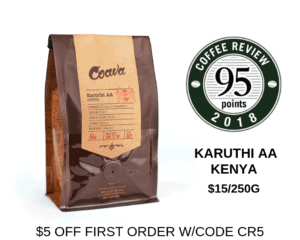 (Five of the 12 top-rated coffees reviewed here were dried-in-the-fruit, natural-processed coffees produced in regions traditionally associated with wet- or washed-processing.) These are types that are now commonly seen on the lists of upmarket specialty roasters, but may remain little-known by mainstream consumers or those newer to fine coffee. The five coffees that we placed in this category are Willoughby’s Panama Don Julian Pacamara (95); Kickapoo’s Ethiopia Charbanta Natural (95); Hula Daddy’s Kahiko Holiday Coffee (a Kona natural; 93); the Roast House Gigisa Ethiopia (also a natural; 93); and Naked Coffee’s Ethiopia Limu (another natural; 93). The Pacamara. Pacamara is a cross between the giant-beaned Maragogipe variety and Pacas, a compact-growing selection of the heirloom Bourbon. It is a precious but unstable hybrid that requires careful curation by the farmer to maintain consistency. The 95-rated traditionally wet-processed Willoughby’s Pacamara is among the most impressive examples of this variety we’ve encountered this year. This bold, rich version offers notes of butterscotch, lavender, tamarind and mango, netting a sweet-savory, juicy cup. At $49.99 per pound, it is a significant investment in sensory pleasure, and an appropriate gift for any coffee connoisseur experiencing Gesha burnout. Three Ethiopia Naturals. Three excellent natural-processed (dried-in-the-fruit) Ethiopia coffees are reviewed here, confirming that naturals are not only increasing in popular appeal, but that their quality and variety of expression is improving concomitantly. Most coffees from southern Ethiopia continue to be wet-processed, and meticulously so, promoting the sweet florals and crisp intricacy associated with coffees from this famous region. The more recent exploration of natural processing methods is, in part, born out of the need for water conservation, but it also speaks to the desire of the third wave coffee communities in consuming cultures and their collaborators at origin to experiment with the more fruit-toned, sometimes even discreetly fermented, coffees that are often the result of dried-in-the-fruit processing methods. 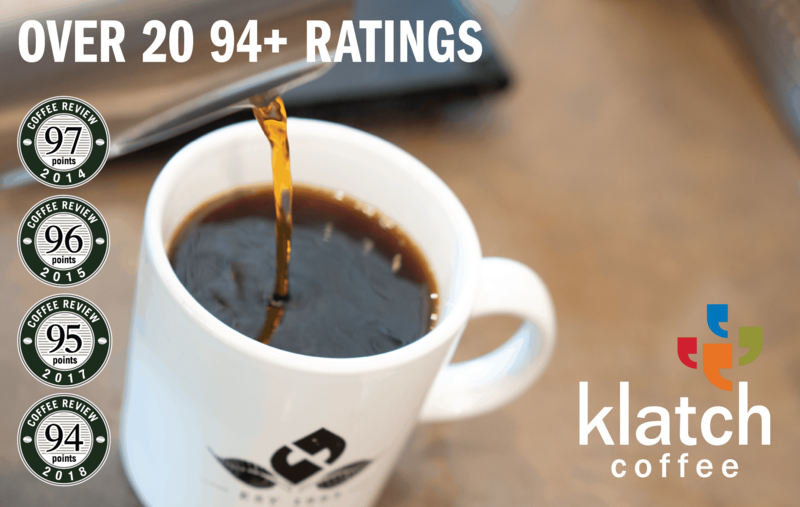 Kickapoo’s exceptional 95-rated Charbanta, a delicate, fruit- and spice- toned cup, comes from a new cooperative made up of former members of the well-known Idido Coop. It’s certified organic, and a value at $18.00 for 12 ounces. Also certified organic is the 93-rated Roast House Gigisa, wittily packaged in an apothecary bottle that conjures coffee as vitamin or restorative medicine (which, for many of us, it is). And Sacramento-based roaster Naked Coffee’s 93-rated Limu, also natural-processed, is a nod to an Ethiopia coffee-growing district lesser known than the more celebrated Sidamo or Yirgacheffe regions, and another good value at $21.00 for a full pound. A Kona Natural. Finally, we have a uniquely compelling 93-rated Kona from Hula Daddy produced entirely from trees of the Guatemala Typica variety. This variety is a strain of Typica that was brought from Guatemala and widely planted in Kona some decades ago, but is now being supplanted by a mix of other, more modern tree varieties, making a pure lot of the original Typica strain something of a treasure. However, the processing method for this coffee is hardly traditional: Unlike most all other Konas, which continue to be wet-processed, it is a dried-in-the-fruit natural. With compelling aroma and flavor notes of scorched lemon zest and passion fruit, this is another small-production, special-occasion coffee at $44.95 for 8 ounces, one that may be worth the money for an aficionado open to a fine Kona that is simultaneously traditional and innovative.